The South Easterly winds are blowing, the BC Ferries are not running, we still have power. The Robbins are busy finding worms and insects on the freshly mowed front yard. The Robbins in the back yard are larger and fatter. Bigger worms, better grass? Do Robbins hear the worms moving under the ground? They listen, find and pick. This is early April 2010. Remoteness brings challenges to modern living. If the electricity from BC Hydro is down because of the windstorms, computers and eventually phones will no longer work. We carry buckets of water from the creek into the house to flush the toilets, because the water pump and pressuring system does no longer work. The Italian coffee machine is silent. Even the auger for the pellet wood stove needs power, and the stove gets cold and powerless. We actually have to talk and entertain ourselves without all the electronic gadgets and machines. Not easy, but fun. What are you thinking? Do you want a cup of tea? Cortes, an island in the Strait of Georgia, the Salish Sea, between Vancouver Island and the Mainland of British Columbia, right at the entrance of Desolation Sound is part of the Discovery Islands. Cortes is approximately 25 km long and 13 km wide. Most people live on the Southern half of the island. The Northern half has no roads and is by water access only. About a 1000 people live permanently on the island, in summer it is probably more like 2000. A very colourful group of people: First Nations people, old timers, business people, permanent half year people, retired Hippies, cool and hottie young people, summer residents, recluses, sailors, fishermen, Oyster pickers, organic farmers, Artists, the free spirited and the retired Type A.
Cortes Island was named after Spanish explorers and mapped in the late 1700 by Valdez. 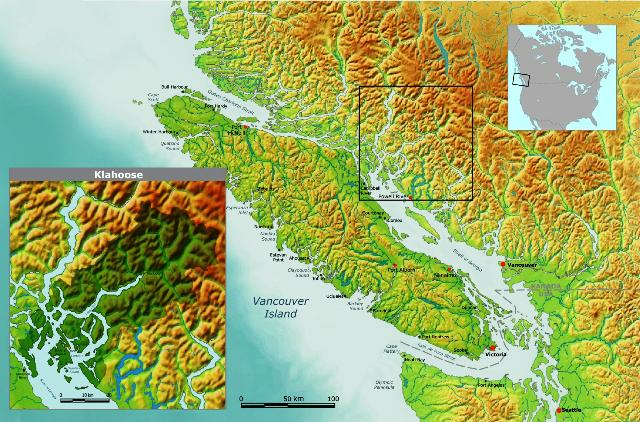 The Klahoose First Nation people live in Squirrel Cove. They relocated to that location from their traditional village in Toba Inlet. The Klahoose are part of, with their neighbours the Sliammon, Homalco, whose territory is on the mainland and K'omoks, the larger grouping of the Comox people, which is a subgroup of the Coast Salish. Their ancestral tongue is the Comox language. In the 1800 the miners and the loggers came, and later the optimistic homesteaders. Bc Ferry service only arrived in 1969, and electric power in 1970. A large Bald Eagle is circling high above Smelt Bay. Looking for fish, small birds, or just going for a fly-by? Just yesterday a Bald Eagle was devouring its prey on the water's edge at low tide. The prey was so heavy, the eagle could not lift off and fly back to its nest. Eventually the eagles' mate arrived and helped eating the fish for a long time, while its mate kept guard. How often do eagles eat? According to some research, they could go for a few days without food. They have storage sacks, crops on the side of their neck. They also are regurgitating their food. Often I see one of the Bald Eagles land on the treetop close to our home. They just sit there and observe the water. Patiently they hunt by playing a waiting game. They spend most of their time perched in trees. They use their exceptional eyesight to scan for food. From its viewpoint, a Bald Eagle can see a surfacing fish from more than a kilometre away. The other day we heard a great racket. Crows were chasing a Bald Eagle: guess what he carried away in his talons? The crows protested and were not impressed about the thief who stole their hard earned food. Woodpeckers chisel out square holes on trees. Do they use the holes as their nesting grounds? These are probably cavities of Pilated Woodpeckers. These birds are almost as large as crows, mostly black with a distinguished red head. They are the largest woodpeckers in North America. They love carpenter ants living in timber, and stumps. We can see these very graphic looking rectangular cavities all along Smelt Bay Park. Apparently these Woodpeckers use their enormously long, sticky tongue to reach the ants inside the cavities. These cavities are just for food supplies and would not be large enough to be where they make their nests. 4:30 am, I jump out of bed. The house rumbles, there was a big bang outside, the rain is pounding the sliding door of our bedroom, the deck chairs are sliding and bouncing in the wind, the Westerly winds are howling, but the stars are quietly glowing in the night sky. Another storm is hitting Cortes, this time from the West. Uneasy sleep – tossing and turning – my thoughts are calming me down: don't worry our home is as sturdy as it gets. 7:00 am, coffee time. Wow, the storm is still raging, but we did not loose power. The world out there looks wonderful: white caps, waves, snow covered mountains on Vancouver Island, sunshine, and the water taxi rushing into Manson's' Landing along Marina Island. Amazing how different the storm looks now. That calls for a second cup of coffee. I have just run across your site and article. Thank you. As a city slicker for years and now mid Island myself and husband, thinking of more remote, simpler. Good to hear anything we can from those who have choosen this lifestyle. L.